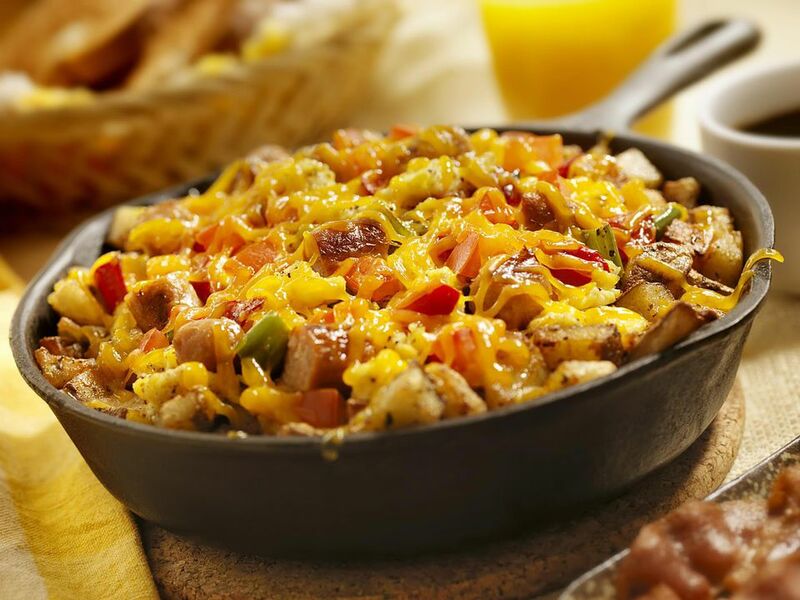 This delicious and rich recipe for Southwest crockpot breakfast with Tex Mex flavors cooks overnight in your crockpot. It's the perfect dish to wake up to on a cold winter morning. But if you have a newer, hotter cooking slow cooker, we would recommend making this recipe for a brunch instead. The egg mixture can burn in some appliances if it's cooked longer than 6 hours. If you are making this recipe for company, try it out first a week or so ahead of time. This recipe can be as mild or spicy as you'd like. If you like spicy food, add more green chiles, or use jalapeno peppers instead. You can also use Pepper Jack cheese in place of the Monterey Jack. If you like your breakfast food milder, reduce the chili powder, use green chiles in place of the jalapeño peppers (or omit them), and reduce or omit the cayenne pepper. This egg dish should be served with something cooling. A sweet and tart fruit salad would be really good. And some bread is a good idea too. Little sweet rolls would be a great contrast or choose scones or some muffins. A simple coffeecake would be a good accompaniment as well. Top this recipe with some cool sour cream, some chopped avocados, or a mild guacamole for a wonderful finish. Hot coffee, orange juice, and cold milk are all you need for a great meal. Grease inside of 5-quart crockpot with butter or spray it with nonstick cooking spray. Starting with sausage, layer the cooked and drained meat, onions, peppers, chilies, and cheese into the slow cooker, repeating the layering process until all of the ingredients are used. In a large mixer bowl, beat the eggs with a wire whisk or eggbeater until combined, then pour over mixture in the crockpot. Cover the slow cooker and cook on low 7 to 8 hours or until the temperature reaches at least 165 F. Serve this recipe immediately with sour cream or fresh salsa. If you have a newer, hotter cooking crockpot, check at 5-1/2 hours. To serve, scoop up portions and serve on warmed plates.